Back by popular demand! If you've ever dreamed of riding an ATV in Nevada's Mojave desert, this is the tour for you. All you need is a thirst for heart-pounding adventure, and your tour guide will supply the rest. Your four-hour trip to the Nevada Desert begins with complimentary air-conditioned transportation from Las Vegas to Jean, Nevada. After a brief but informative orientation about your all-terrain vehicle, you'll be provided with safety equipment. Then, get ready for one of the most thrilling ATV off-road experiences of your life! 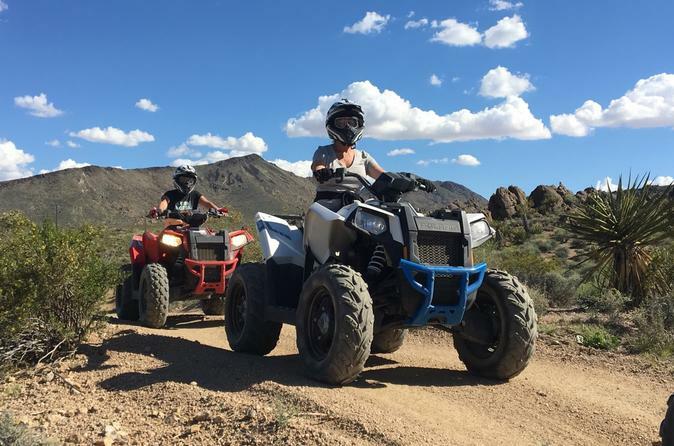 Your two-hour ATV ride takes you through the historic Hidden Valley National Monument, next to extinct lava beds, through and the rugged McCullough Mountain Range to the Primm Valley overlook. Travel exciting trails around large boulder formations that make up part of the Mojave Desert. What a ride! Your tour ends with air-conditioned transportation back to your pick up location.